Looking for Laguna Niguel bee removal? Bee swarms can be very intimidating. The Bee Man is committed to keeping you and your loved ones safe. Bee infestations can cause damage and stress. Knowing where bees typically build hives is important (click here for a graphic). Bee swarms form when a new queen is born in a hive. Since hives can only have one queen, the old queen takes half of the original colony and flies away. This swarm, or bundle of bees, starts looking for a new place to build a hive. Bee swarms, although menacing, are actually very docile. Bees only get aggressive if they feel a need to protect their hive. Since a swarm has no hive to protect, they are literally homeless with no home to protect. 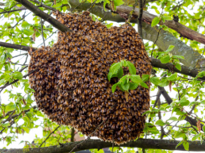 A swarm of bees will find a temporary place to stay such as a tree or other area. As a result, these swarms are usually in the open. The swarm is waiting for the scout bees (the swarm’s “real estate agent”) to find a new place to build a hive. Swarms will stay in a bundle for up to 3 days. If the scout bees do not find a new location to build a hive, the swarm will start making an “exposed” hive wherever they are. However, this is very rare because hives are built in areas that are protected from predators and provide a constant temperature. The Bee Man offers professional Laguna Niguel bee removal services to residents and commercial customers 24/7. Although very docile, we advise not disturbing the bees while they are clustered together. Please refer to our safety tips here. Finally, if you need any Laguna Niguel bee removal, please contact The Bee Man at (949) 455-0123 before any property damage occurs.